Roll with ease and style. 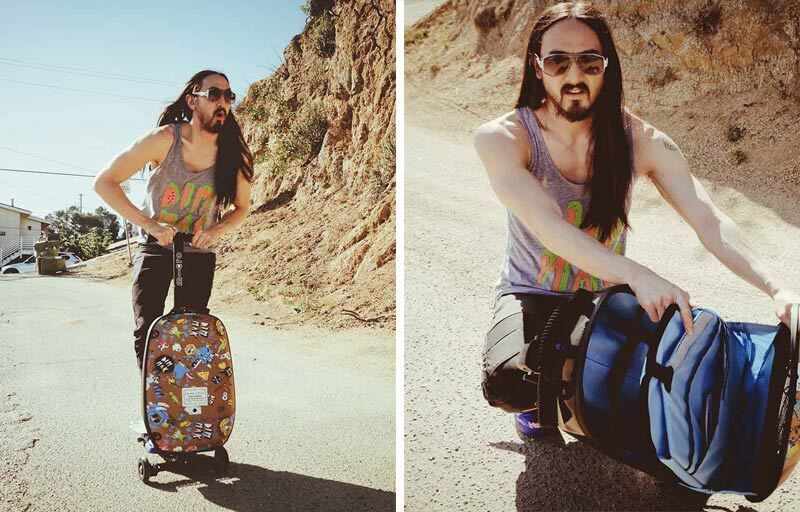 Jump on board with DJ Steve Aoki on his new Micro Luggage scooter with an integrated Bluetooth Sound2go sound. Attention grabbing, fun and easy to use the Steve Aoki Luggage is a great addition to add excitement to travel by riding your carry on. Swiss designed and fitting up to 26L the Steve Aoki Luggage can easily fit your travel belongings encased in a hard shell for strength, durability and protection. With the print personally designed by Steve Aoki you can guarantee you’ll turn a few heads scooting by. The luggage scooter can be used both as a luggage scooter and (with the foot plate folded) a traditional wheely luggage. Like every other Micro Scooter the polyurethane wheels ensures a smooth ride with an easy to use adjustable T-bar. The Micro Steve Aoki Luggage is suitable for riders up to 100kg. The scooter itself weighs 5kg and a 26L capacity. The Micro Luggage scooter is normally approved as hand luggage on most airlines. The dimensions of the Micro Luggage scooter measure 56cm x 35.5cm x 25.5cm. However, airlines do sometimes change their hand luggage specifications so please do check with your airline before you travel! The Micro Steve Aoki Luggage has an integrated Sound2go Bluetooth speaker, allowing you to listen to your music hands free whilst you ride. 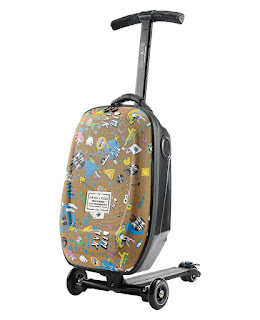 Like other 3 wheeled Micro Scooters the Steve Aoki Luggage is built on an intuitive lean to steer mechanism which easily turns with the riders weight transfer. Starting rolling like Steve Aoki. This one cool piece of luggage.